We all know that data entered in the tables are persisted in the physical drive in the form of database files. Think about a table, say Customer (For any leading bank India), that has around 16 million records. When we try to retrieve records for two or three customers based on their customer id, all 16 million records are taken and comparison is made to get a match on the supplied customer ids. Think about how much time that will take if it is a web application and there are 25 to 30 customers that want to access their data through internet. Does the database server do 16 million x 30 searches? The answer is no because all modern databases use the concept of index. Index is a database object, which can be created on one or more columns (16 Max column combination). When creating the index will read the column(s) and forms a relevant data structure to minimize the number of data comparisons. The index will improve the performance of data retrieval and adds some overhead on data modification such as create, delete and modify. So it depends on how much data retrieval can be performed on table versus how much of DML (Insert, Delete and Update) operations. In this article, we will see creating the Index. The below two sections are taken from my previous article as it is required here. If your database has changes for the next two sections, you can directly go to section 5. To explain these constraints, we need two tables. First, let us create these tables. Run the below scripts to create the tables. Copy paste the code on the new Query Editor window, then execute it. Note that there are no constraints at present on these tables. We will add the constraints one by one. Right click the student table and click on the modify button. From the displayed layout, select the StudId row by clicking the Small Square like button on the left side of the row. Click on the Set Primary Key toolbar button to set the StudId column as primary key column. Now this column does not allow null values and duplicate values. You can try inserting values to violate these conditions and see what happens. A table can have only one Primary key. Multiple columns can participate on the primary key column. Then, the uniqueness is considered among all the participant columns by combining their values. 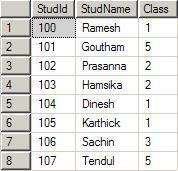 The primary key created for the StudId column will create a clustered index for the Studid column. A table can have only one clustered index on it. The index will form the below specified binary tree. Note that for a given parent, there are only one or two Childs. The left side will always have a lesser value and the right side will always have a greater value when compared to parent. The tree can be constructed in the reverse way also. That is, left side higher and right side lower. Execution without index will return value for the first query after third comparison. Execution without index will return value for the second query at eights comparison. Execution of first query with index will return value at first comparison. If numbers of records are less, you cannot see a different one. Now apply this technique with a Yahoo email user accounts stored in a table called say YahooLogin. Let us assume there are 33 million users around the world that have Yahoo email id and that is stored in the YahooLogin. When a user logs in by giving the user name and password, the comparison required is 1 to 25, with the binary tree that is clustered index. Look at the above picture and guess yourself how fast you will reach into the level 25. Without Clustered index, the comparison required is 1 to 33 millions. Got the usage of Clustered index? Let us move to Non-Clustered index. A non-clustered index is useful for columns that have some repeated values. Say for example, AccountType column of a bank database may have 10 million rows. But, the distinct values of account type may be 10-15. A clustered index is automatically created when we create the primary key for the table. We need to take care of the creation of the non-clustered index. 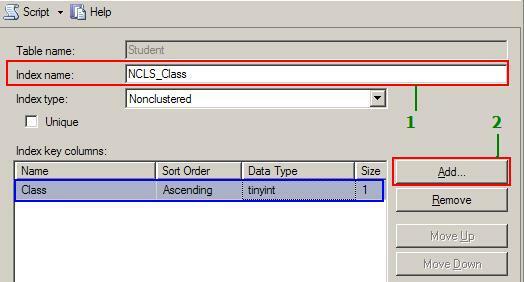 Follow the steps below to create a Non-clustered index on our table Student based on the column class. 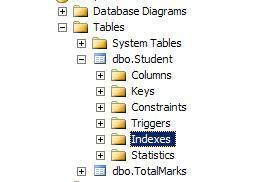 After expanding the Student table, right click on the Indexes. And click on the New Index. From the displayed dialog, type the index name as shown below and then click on the Add button to select the column(s) that participate in the index. Make sure the Index type is Non-Clustered. In the select column dialog, place a check mark for the column class. 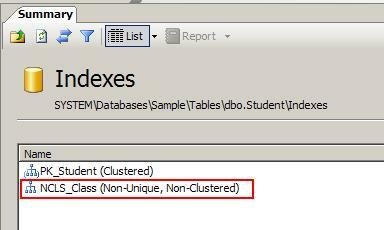 This tells that we need a non-clustered index for the column Student.Class. You can also combine more than one column to create the Index. Once the column is selected, click on the OK button. You will return the dialog shown above with the selected column marked in blue. Our index has only one column. If you selected more than one column, using the MoveUp and MoveDown button, you can change order of the indexed columns. When you are using the combination of columns, always use the highly repeated column first and more unique columns down in the list. For example, let use assume the correct order for creating the Non-clustered index is: Class, DateOfBirth, PlaceOfBirth. Click on the Index folder on the right side and you will see the non-clustered index based on the column class is created for you. 7. How Does a Non-Clustered Index Work? A table can have more than one Non-Clustered index. But, it should have only one clustered index that works based on the Binary tree concept. Non-Clustered column always depends on the Clustered column on the database. You went to the Index page (it has total 25 pages). It is already sorted and hence you easily picked up Regular Expression that comes on page Number 17. Next, you noted down the number displayed next to it which is 407, 816, 1200-1220. Your first target is Page 407. You opened a page in the middle, the page is greater than 500. Then you moved to a somewhat lower page. But it still reads 310. That’s all, you started exploring what is written about Regular expression on that page, keeping in mind that you need to find page 816 also. In the above scenario, the Index page is Non-Clustered index and the page numbers are clustered index arranged in a binary tree. See how you came to the page 407 very quickly. Your mind actually traversed the binary tree way left and right to reach the page 407 quickly.